UPDATE! Build your own HUD! See the tutorial on the new SL for Nowt blog, here. Your other LM storage option is notecards. Simply create a new notecard and drag your LMs into it. 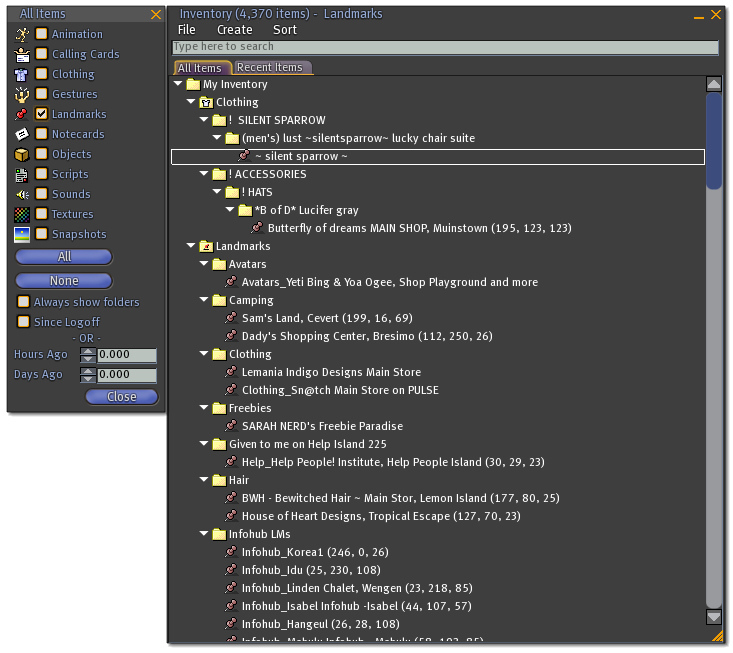 You can create different notecards for your LM categories, such as skins, clothing, places to visit, etc. When you want to visit a place, open the relevant notecard, click the LM link inside and use the popup window to go there. The advantage of this is that the LM stays in the notecard, and doesn’t go into your inventory. You can also write a bit about what the store sells or why you like the place, underneath the LM itself in the notecard. So now that you have a few places to store your favourites, what about all of those hundreds of LMs you currently have? Well I’m afraid this is the painful bit. It took me a good half hour of clicking and not a little bit of RSI, but I was stunned at the amount of LMs I got rid of. Here’s what you need to do, once you’ve stored your favourite LMs using your preferred method. First of all, empty your trash and make a note of how many items you have once you’ve done it. I always do this at the start of an inventory management session, then when I’ve finished the session and emptied the trash again I can see how many items I’ve thrown out. That’s always a good morale boost and a reward for the time spent sorting! Hold down the CTRL button on your keyboard and click each Landmark in turn. Don’t click the folders, because when you hit Delete, you’ll be deleting the entire folder! Just click the LMs themselves. Once you’ve clicked a good handful (I wouldn’t recommend more than about 50 at a time) then hit the Delete button on your keyboard, or right-click your Inventory and select Delete. Then carry on clicking and Deleting until you’ve got rid of them all. At this point you’ll begin to realise just how many LMs you actually have clogging up your inventory! If you have a whole bunch of LMs in one folder to clear out, click the first one, then hold down the Shift key and click the last one. That will select them all, quickly. It’s as simple as that, but yes it’s a bit time-consuming. If you don’t want to dedicate a full half hour to it, why not do it in bits and pieces: maybe while you’re stalking a lucky chair or hanging around a Mobvend while people TP in to lower the price? Once you’ve done it, though, remember to keep on top of it! Delete all extraneous LMs you receive from now on, and rename the ones that have asterisks and exclamation points at the start, so they stay in their correct alphabetical place in your inventory! The bonus, too, in getting rid of all your old LMs, comes when you don’t teleport to where a specific store is, only to find that’s where it was and is no more. Regardless, you’ll still have to search for it, but you’ll save yourself a wasted TP. Now hop to it and surprise yourself. How many LMs did I delete? Just over two thousand. Let me know how many you got rid of! First of all I want to say awesome blog! I had a quick question in which I’d like to ask if you do not mind. I was curious to find out how you center yourself and clear your head prior to writing. I have had difficulty clearing my mind in getting my ideas out there. I do enjoy writing but it just seems like the first 10 to 15 minutes are usually wasted simply just trying to figure out how to begin. Any suggestions or tips? Cheers! I’m afraid I never have a problem with writing, and I don’t need to clear my head or centre myself before writing. I just have an idea of what I want to write, and I splurge it out on the screen. You could try noting down a laundry list of things you want to make sure you cover in the piece you’re writing, and then just ramble away on any old topic until you’re past those 15 minutes of ‘wasted’ stuff and you’re in a place where you’re ready to start writing what you really want to write.